Abstract : This document describes the possible problems encountenered when developing a realtime ship to shore IP4 connection tracker/spy/packet modifiier when relying on various transport ethers such as satelite links and wifi antennas. It focuses mainly on a Linux based solution. This document discusses a preliminary architecture for packet routing on a Dualog-enabled boat computer. This document specifically assumes linux, however ipfilter seems the only Linux dependent module. If this could be replaced on windows, relying on IPHelper like approaches, then our router will be platform independent. The router as we see it contains a number of subsystems, each concerned with a specific level of detail. These have been chosen in order to optimize the throughput and avoid unnecessary authentication. (For instance we do not want to authenticate every packet, we rather want to do this at the connection level). It also leaves open which protocol is used over a specific tunnel, as long as the end-result ends in an ip-packet. The first level that interest us is the control and alteration of packets such that we can forward them over a tunnel, deliver them locally, neglect them or alter them. The rules used to filter packets must be set from within the connection control module. The packet module must support connection detection and connection tracking. When a connection is first created it will contact the connection control module, that will either allow or deny the connection by altering the ruleset used by iptables. This requires the possibility to create a new filter queue that lists 'connection-initiating packets'. For connection oriented connections these can be automatically detected, connections that are inherently connection-less should be verified in a lookup table stating sender and/or receiver rules. Everything falling out of those must be considered as connection initiating. When a connection is allowed the iptable-rules will be such that packets will be forwarded and handled automatically. The second level where we want to have control over is which connections are allowed. The connection control module will update the ipfilter rules in order to allow or deny connections. It gets informed by the packet control module when a connection is requested and then it can choose to alter the tables to allow this connection or deny it. A second task for the connection control module is to manage off-boat tunnels by setting up ipip, ppp or other tunnels. This might include submodules (threads) that listen on specific interfaces for incoming packets. 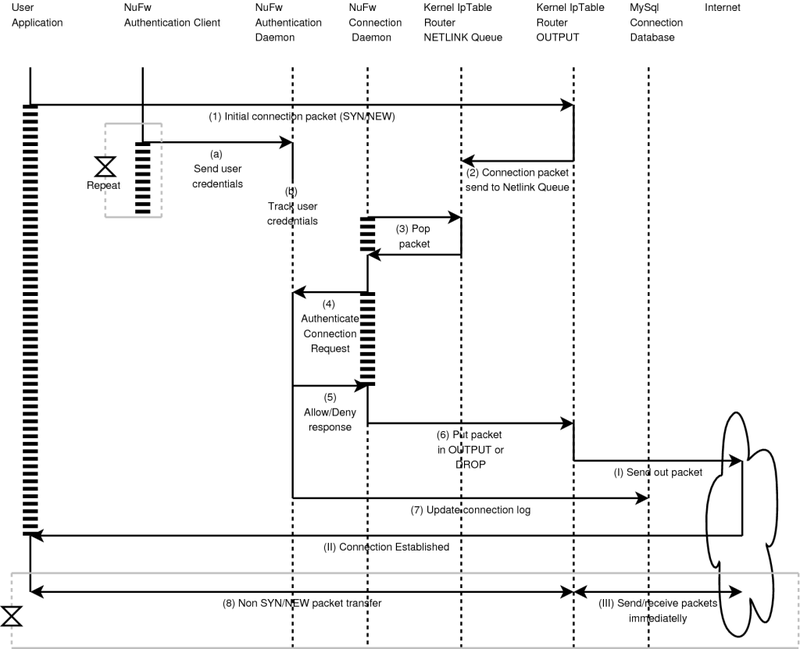 When changes in the connection state occur (tunnel broken, tunnel created), the router control module must be informed. That one will update the rules regarding connection usage. Every rule in the connection level control system can require authentication which is a flag that can only be set by the authentication system. From a data-management point of view we believe that the following fields are relevant for connection management. This module decides which tunnels are accessible by whom and controls the routing preferences, relying on LCR tables or rules. These rules will take into account billing information and make sure that roaming will be handled properly. E.g: when on-land, an IPIP tunnel might allow fast communication, allowing everybody on board to surf on Internet freely, but as soon as a fall-back to satellite becomes necessary, only specific personell can use Internet freely. Others might require authentication and will be billed for their usage. Alterations of rules can occur from various places, including the boat's owner, the Dualog support service (receiving updated LCT tables and realizing them) , the current boat administrator (captain ? :)) and possible others. This module interacts with the authentication system to verify whether certain rules can be altered or not. connections created by the user. This module interacts mainly with the connection control module that will update the specific user/host flags and behave accordingly when a connection is pending. In case the connection control module contacts the authentication module for verification of access, then the authentication module will need to communicate over the standard API towards the originating host and user, if possible. Provided through a socket, CORBA service or whatever seems necessary. The API towards the router will give a low level access to the functions provided by the router. This is of course not the only problem that needs to be resolved a secondary problem is firewalling the inside world and performing address translation where necessary. This is in the linux world fairly standard. Most programs rely on iptables to perform this function nowadays. A program we investigated is called firestarter and it proved to be a very interesting program. It will connect one interface to another and translate packets from one to the other thereby linking the outside world to the inside and the other way around. The rules resulting from something such as netfilter. This simple function is performed with great ease but the complexity of address translation and proper forwarding should not be underestimated. The ruleset resulting from masquerading quickly becomes long and, despite being readbale, there is a big difference between reading the rules and writing them ourselves. At the moment the linux kernel has a huge list of modules to do ipfiltering that all perform some function. We cannot expect to reimplement large parts of this in a windows based world. We touch upon two important problems that one must be aware of before proceeding to reimplement existing functionality. Connection tracking- The first is that packet filter rules needs to understand application level protocols before they can be properly rerouted. A typical example are FTP connections. An FTP connection is established by connecting to the server who will return the port and IP address of the actual data deliverer. Since the FTP server is not aware of the fact that it is being filtered, it will return a wrong IP number. To resolve this the packet filter routines need to understand the FTP protocol and replace the returned address and port with a proxy address. Packet Mangling- Another problem is that packets can be split in pieces through the routing process. This results in packets that do not contain much useful information, except for the stack that will receive it. Many different modules have been implemented to recognize and properly handle mangled packets. A big problem with modern networks is that many of them block unwanted ports. This results in many cases that tunnels cannot be set up using standard approaches. We found a document that explains a very interesting technique to pierce through firewalls using standard protocols and ports (http://www.faqs.org/docs/Linux-mini/Firewall-Piercing.html). We believe such approaches might be very useful to Dualog, for instance by providing the tunnel endpoint on every possible port. A packet is emitted by the client. A user Id is associated to this packet and the autorisation is given on a user and filtering base. A standard application sends a packet. The Nufw client sees that a connection is being initiated and sends a user request packet. The Nufw server queues the packet and sends an auth request packet to the Nuauth server. The Nuauth server sums the auth request and the user request packet and checks this against a authentication authority. The Nufw server transmits the packet following the answer given to its request. Another approach that could be useful is to avoid any ip-packet level translation by only (or also) providing high level protocol forwards. A very useful program to demonstrate the power of this approach is 'redir' (http://sammy.net/~sammy/hacks/). will redirect a local webbrowsers' request to port 9877 to the google web server. In general high level protocol translations are only possible in connection oriented environments. It is however unclear which connection less applications will be used because these typically require an IP level address translation that is aware of the protocol being spoken. NUFW  is a program developed by Eric Leblond <regit@inl.fr> and Vincent Deffontaines <gryzor@inl.fr> that provides single user authentication of network connections. Its elegant design prompted us to investigate the software in more detail. This report describes the overall architecture of NUFW , how to get it working and its current limitations in the setting of ship-to-shore authentication protocols. Some sections of this document are taken from the NUFW How-To . These sections are marked in italic. We tested version nufw-2.0-beta2 since the previous 'stable' version nufw-1.0.25 did not properly work. Crucial is the Linux Kernel with the Netlink and IPQueue [4, 5] modules enabled and loaded. This allows for a clear socket-link towards iptables from user-land. The iptables will be used to redirect every connection establishing packet (SYN) to a separate queue. The NUFW connection daemon will then make a decision and either drop the packet or allow it through. The NUFW connection daemon connects to the NUFW authentication daemon on one side and to the kernel on the other side. It authenticates connections by stopping or passing through packets that create connections. The NUFW Authentication Daemon gathers credentials from users to allow certain connections. It connects with 1 or more NUFW connection control daemons, a database for logging connection activity and one or more Authentication Clients. The authentication daemon can both push and pop 'credential' packets. The NUFW Authentication Client. This process must be run by the various users. It will provide one or more authentication clients with the proper credentials to set up specific connections. The Logging Database. The NUFW authentication client can log connections into a standard database (MySql , PostgreSql ). At the moment there seems no packet counting mechanism in place. Figure 3: The data flow between various components to set up an allowed connection. Assuming that the user started an NUFW Authentication client, then the process of setting up a connection can be broken down in smaller pieces. These are presented in the control flow diagram of picture 3. The picture uses a sort of message sequence diagram, loosely based upon UML. We added some notation to support threads and better illustrate the state of concurrent processes. The top line of each message diagram contains the names of the relevant actors. Below every actor we find a vertical line, which represents a (virtual) thread/process. This line is drawn depending on the thread/process state. If no execution stack is present, no line is drawn. If an execution stack is present and executing, a full line is drawn. If an execution stack is present but not executing because it is waiting for any thing to happen, a dotted line is drawn. This means that virtually anybody can re-initiate the execution. If an execution stack is present but not executing because it is waiting for some specific thing to happen, a vertical line with horizontal dashes is drawn. A specific thing can be, for example, waiting for a return of a message. The authentication daemons keeps track of proper credentials and uses these later on to decide which connections are allowed. the Netlink queue is popped by the NUFW authentication daemon, which in turn will ask the authentication daemon whether the packet is allowed through. the connection daemon receives the decision on the connection and if the packet is allowed it will put it back into the output chain, otherwise the packet will be dropped. This process only happens for the first connection packet of a TCP connection. All other packets in the connection will be passed through immediately, imposing no overhead at all on the connection. We use debug flags as we want to have all messages for testing the whole setup. A setup allowing multiple users on one machine to have different access rights can be done in a couple of steps. We discuss the configuration of the various modules. The kernel needs to support IPTables  and Netlink  queue drivers. The NETLINK driver will transfer packets from kernel mode to user mode as requested in IPTables. The module name for the Netlink driver is IP_NF_QUEUE. We have been working with kernel 2.6.13. Remember to load the ip_queue module because NUFW will not warn that the module is not present and IPTables will not deliver the packets to the right place. The first two lines state that any new SYN packet should be placed into the Netlink queue. The last line specifies that all other packets can be delivered to their right address. You have to set a strong password here and keep it secret. And don't forget your key files (here, nufw-key.pem and nuauth-key.pem) should always remain private. The second process is starting authentication daemons on various machines. The two main purposes for the existence of separate authentication and connection daemons seems to be speed and distribution. By separating the connection module from the authentication and logging, one can put in any heavyweight authentication protocol one might wish for. The connection daemon will not notice any of this and simply provide yes or no answers to connection requests. Similarly, the authentication daemon can be ran on (many) other machines. by setting the variable nuauth_acl_check_module. To be able to proceed quickly to test, we will use the system module for user and the plaintext module for acl. A sample file for the plaintext acl check module is available in the conf directory, acls.nufw. Copy it to /etc/nufw and adjust the group of the ssh acl to have it matching the group of a system user you will use later to authenticate on the system. In our specific test we have been using libsystem for authentication and libplaintext for access control. In the configuration file /etc/nufw/nuauth.conf the following directives were set. The file /etc/nufw/acls.nufw contained in our situation the following. The first user has gid 1005, the second user had group if 1007. ** Message: Problem with certificate trust file : Error while reading file. ** Message: [+] NuAuth started. ** Message: [+] NuAuth is waiting for client connections. ** Message: [+] NuAuth is waiting for NuFW connections. ** Message: Bad password for user "werner"
** Message: [+] User "werner" connected. In our case this was somewhat problematic because the nuauth server was listening to all interfaces (127.0.0.1, 192.168.1.125 and 10.0.0.9). If we tried to connect to the local authentication daemon 127.0.0.1, this would succeed, but as soon as the first connection request was sent we would get the response: 'authentication client at 127.0.0.1 authenticated a connection for 192.168.1.125'. The only way to solve this was to connect to the actual 192.168.1.125 address, instead of the localhost. We must take into account the information provided in the NUFW FAQ , namely. How does NUFW react to Network Address Translation ? There are two kinds of NAT : Source NAT and Destination NAT. Source NAT is used when source IP of the first packet of a connection is modified, Destination NAT is used when the Destination IP of the first packet of a connection is modified. NUFW cannot cope with Destination NAT because, on one hand, the packet sent to the gateway is changed before it reaches NUFW , on the other hand, the data describing the packet contained in the user authentication packet are not (and cannot be) changed by the NAT. However, it is possible and secure to chain a NUFW gateway with another gateway and perform Destination NAT on the second gateway. So NUFW and Destination NAT are not compatible but Destination NAT can?t be used to cheat NUFW . NUFW works fine with Source NAT, provided Source NAT is performed on the same machine as NUFW , or another machine, but not a host between NUFW server and the client. NUFW is a well written program that demonstrates some of the architectural decisions necessary to develop/deploy of a per user authentication system. Whether we actually need a 'per-user' authentication system is unclear. In case we don't need it we might rely on a somewhat simpler, per machine authentication system. The architecture itself is fast (only the initial packets are checked), modular and extensible. How does NUFW determine which user is setting up a connection ? There is a windows client available, but I believe that this is not such a straightforward client since the NUFW authentication client seems to track which port is opened by whom. The current connection daemon seems unable to count packets per connection at the moment. The good sides of the current software architecture are its modular authentication and ACL accounting. It supports logging, authenticating with various modules. One of those is PAM. PAM is a very convenient way for extending authentication to "exotic" directories. In particular, PAM lets one interface nuauth on NT domains, Active Directory, Radius, etc. Since NUFW supports PAM authentication, it forms a very viable approach towards authentication. The Dualog stack should provide a platform independent protocol stack that offers efficient address translation (shielding the inner boat from the bad world outside), efficient forwarding over a wide variety boat-land connections, some form of interface that allows a per user authentication and accounting of all incoming/outgoing UDP/IP and TCP/IP [14, 15] connections. The Dualog stack, as envisioned now, consists of a number of modules, each with specific responsibility. The main challenge lies in finding a set of modules (supported in both worlds) that can be easily altered through a user-land API. This document names those modules, describes their responsibility, their support in Windows/Linux and provides information on the programmers interface towards these modules. Figure 4 presents an overview of the stack. The right side of the picture is mainly located in kernel space. The left side of the picture will provide a uniform interface to alter the stack behavior and is located in user-space. The following subsections correspond to specific modules in the picture. The devices used within the system are either inward Ethernet devices or outward devices, such as Ethernet, modem, etc. The inward devices communicates towards the boat internal network, the outward devices, through various channels, will all connect to the Dualog haven. In Linux these devices tend to be called /dev/eth0, /dev/eth1. In Windows  these devices are called 'network interfaces'. Most devices will be associated with an IP tunnel [17, 18], that will wrap incoming packets, send them over a specific transport medium and unwrap them at the other side. The IP Tunnels are based on a standard protocol, supported both by Windows and Linux. The combination of device and IP tunnel is called a link. The interaction between most drivers interacting on the stack is very likely through a shared memory accessing the stack. When a device becomes available, the Mobile IP  layer will create a tunnel. All available tunnels will be used for off-ship data transmission. As we see it now, the Secgo software will provide the software. It supports both Windows and Linux. In Windows it is available through an NDIS driver. In Windows this process very likely goes though a kernel module . A socket provides the channel over which to reach the Secgo API. It provides status information on link usage, among which notification of new links and dead links. Bandwidth limitation can be altered through this API as well. Network address translation [23, 24] is necessary for translating 'inside the boat' - packets to 'outside the boat'-packets and vice verca. Because connection filtering is based on connections, network address translation might interfere with its proper working. Therefore our NAT module must be placed after the packet filter (as seen on picture 4). As such, if the Dualog NAT module receives a packet going outward, then it can assume that the connection is allowed. In Windows, NAT can be achieve through using the Windows Firewall . In Linux, IP-Tables  can be used for this purpose. The address translation is responsible for keeping track of state information such as necessary for FTP connections. Very likely we will not need to alter the behavior of this module. The interface towards the packet filter should allow runtime changes of the filter rules and back notification of the specified events. In Linux a packet stopper can easily be achieved through a combination of IP-Tables , IPQ [5, 4] and NetLink. User-space event notification can be realized as described in the previous document titled 'A Brief Study of the NuFw Architecture'. In Windows a packets stopper can be implemented at various stages. 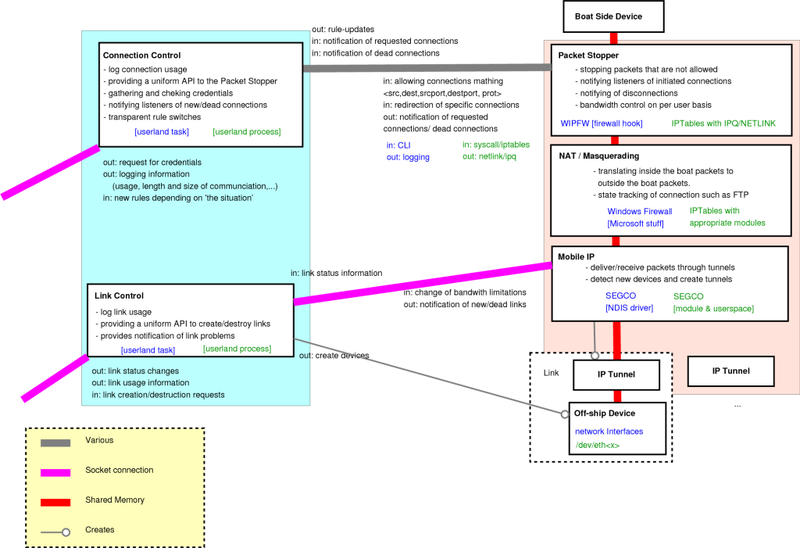 Information on Windows packet filtering and various hooks can be found at , including documentation on the Windows 2000 Packet Filtering Interface (user-space possibility to stop or pass through packets), NDIS Intermediate Driver development, the Windows 2000 Filter-Hook Driver and the Windows 2000 Firewall-Hook Driver. For our purposes, the WIPFW  software seems a promising candidate. It is implemented through a firewall hook (is this correct ? Is this not a Windows filter hook ?). Altering of the stop/pass rules can be done using a command line interface (CLI), back notification can be achieved at the logging level. The WIPFW does not allow rewriting of packets and thus will not allow packets to be redirected. It also does not allow for bandwidth limitations on specified packet types. The presented stack requires a high level of interaction with the rest of the system. Depending on the location and available links we will have different rules regarding who is allowed to make which connection or not. This document is not concerned with the rule system at the moment. However, we need to supply a standardized user-space API to allow realisation of a least cost routing/high control system. Two aspects are crucial. First: the LCR system needs a way to set up links. Secondly, the least cost routing system needs a way to specify which connections are allowed. Both behaviors are located at different places in the stack and will thus be presented by two different user-space processes. Those processes are essentially unification modules, translating a (possibly) platform specific API to the bare decision rules needed by the actual kernel section. With connection we typically mean a TCP/IP connection. How UDP/IP 'connections' are handled is fairly unclear at the moment given the connectionless nature of UDP. The connection control module provide three different services to the LCR. It will provide a push service that, based on information it receives from the LCR, sets up a suitable rule-set and realizes it in the Dualog Stack. It will provide a mechanism to request from the LCR system credentials whenever somebody starts using a connection that is not allowed (pull mechanism). This might require the possibility to redirect non-allowed connections. The connection control module should also support full rule-set switches, thereby determining which connections should be disconnected and which ones should be kept. when the LCR decides to set up a link or bring it down, the link control module needs to realize this in the stack. when important status changes occur in the links (a broken link for instance), the LCR should be informed. At the moment it seems somewhat confusing in which order packets are going through the Windows IP stack. There seems a number of hooks to be available (the firewall filter hook, the packet filter hook and the NDIS driver 'hook'). Where those are located is unclear and whether address translation occurs before packet filtering is something to find out. A small demonstrator indicates that the address translation will actually occur after the packet filtering. The packet filter can easily detect the creation of TCP connections by intercepting SYN packets. There is however no clear alternative to UDP packets. One can simply deny UDP packets from any source to any other source and use the logging mechanism to detect the 'creation' of a connection. There will of course be no 'disconnect' either, so this remains a challenging problem. The WIPFW software cannot do bandwidth control of connections and cannot change the contents of packets. This could be useful to redirect connections to a local 'authentication' server before allowing the connection through. There seem large difference in the way filter rules are changed in IP-Tables  and in WIPFW. Especially, regarding the notification of stopped packets. The Secgo  Mobile IP stack does not allow per user tunnel use. We seem to forgetting the delicate interaction between NAT, connection state tracking and allowing/denying connections. E.g: when an FTP connection is allowed then so must its sister port - automatically. To achieve this we must implement state tracking in our packet stopper, or elsewhere. [connection] a connection is a TCP/IP connection, defined as source/target IP's/ports and protocol. What defines a UDP 'connection' is still fairly unclear given the connectionless nature of the protocol. This document reports on the link between user programs and kernel when altering netfilter behavior. The iptables command we relied on was version 1.3.3 as found in the upstream section of the Debian source distribution. The command is mainly implemented in one big chunk of C (iptables.c or ip6tables.c), which for the largest part concerns itself with command line option checking. A nifty cross-table ensures that only right combinations are recognized. The insert command inserts one or more rules in the selected chain. The delete and delete_num commands delete rules based on patternmatching or by number. The replace rule replaces a specific rule number with another one. Append appends a rule to a chain. The list dumps all the rules to the terminal. Flush empties the selected (or all) chains. Zero clear the packet and byte counter in all chains. new_chain and del_chain create/delete chains. The set_policy command sets the target for the chain. If the end of a built-in chain is reached or a rule in a built-in chain with target RETURN is matched, the target specified by the chain policy determines the fate of the packet. A specific target of interest is QUEUE. QUEUE means to pass the packet to user space. How the packet can be received by a user-space process differs by the particular queue handler. 2.4.x and 2.6.x kernels up to 2.6.13 include the ip_queue queue handler. Kernels 2.6.14 and later additionally include the nfnetlink_queue queue handler. Packets with a target of QUEUE will be sent to queue number '0' in this case. Please also see the NFQUEUE target as described in the iptables manpage. The rename command is aesthetic. zero_entries, append_entry, replace_entry and insert_entry translate to the same identifiers prefixed with iptc_*. Those functions are not defined in the iptable command and seem declared in the standard header file /usr/include/libiptc/libiptc.h. In Debian LibIptc is part of the iptables-dev package, which includes only the static compiled version. The source code can be found in the iptables source package in the /iptables-1.3.3/upstream/iptables-1.3.3/libiptc directory. The libiptc.c file is around 2274 lines but is somewhat more complex. It seems to mange the internal list representation and tracks all changes in a shared memory, which, if something changes is committed to the kernel within the TC_COMMIT function. All the rules and chains are compiler by the iptcc_compile functions which are then send to kernel with a sockopt call. /* This structure defines each of the firewall rules. The actual code associated with a replace can be found in /usr/src/linux-2.6.13.3/net/ipv4/netfilter/ip_tables.c, the do_replace function. This function will 'translate' the incoming table and load modules as necessary. The translation step (translate_table fnction in ip_tables.c) is merely a sanity check which will update the table associated with iptable_filter, iptable_mangle or iptable_nat. The specific modules provides hooks into the table evaluation to make decisions or alter packets as they come along. The ipt_do_table function provides the general rule matching. As previously described the kernel to user space link is easier. A QUEUE target will place any packet into a special connection, which can be approached with lipipq. The packets are wrapped into a structure defined in /usr/include/libipq/ip_queue_64.h. The headers can be found in /usr/include/libipq/libipq.h and are to a large extent self explanatory. This document described the current 'user to kernel' link regarding iptables. Since the format is very specific for Linux and rather extensive it seems that copying this interface into an NDIS driver might require too much work. It is probably better to design a set of rules as necessary and then to translate these into iptables rules. 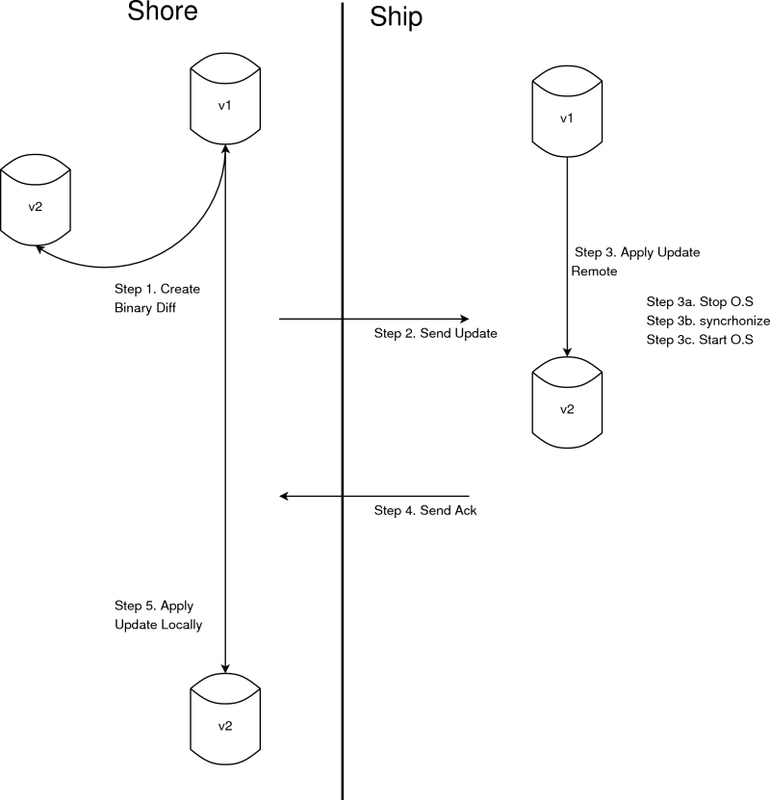 In this document we describe the use of rsync as a means to update operating systems between ship and shore, an environment where bandwidth is of utmost importance. Taken from the documentation: ``The rsync remote-update protocol allows rsync to transfer just the differences between two sets of files across the network connection, using an efficient checksum-search algorithm described in the technical report that accompanies this package.'' The checksum algorithm itself relies on a combined approach of weak (but fast) checksums and strong (but slow) checksums.- When the weak checksums fail, then two blocks are considered different and thus the strong checksums will not be used. Otherwise, the strong ones must match before two blocks are considered to be equal. This two-pronged approach allows rsync to make appropriate decisions on how a block should be transmitted: if a new updated block is similar to any already available block (found in the base-files) then only a reference to that block is transmitted. This prompted us to investigate rsync into slightly more detail as a means to transfer and update the Dualog system without needing to transmit all the data. An especially interesting capability of rsync is that it is possible to fake the remote side locally, meaning that the rsync-diff can be generated entirely at the sending side, then compressed, transmitted and at the receiver side it can automatically be applied. We tested such scenario as follows. Executing this script will create two files called remote-update and remote-update.sh. After opening the VMware windows image and closing it again, we were interested to find the differences between the two files, which lead to an update script of 7.8 Mb uncompressed. After compressing this file with rzip, the differences were around 1.2 Mb, which is a compression ration of 0.0585%. To aplpy the diff at a certain location we can use the following script. It should be called with an argument specifying the directory to which to apply the diff. Of course, this simple test does not take into account any knowledge we might have about specific files (files that should not be updated). Rsync is also capable of performing the same task on a file-system that is not 'one image', however one should be aware that updating files on a running system might not be the smartest thing to do. Therefore we propose the following scenario for one directional updates. The shore keeps both a Local and Fake directory. The Fake directory should always be consistent with the version available on the ship. The shore can update the remote system in the Local directory. To prepare the actual update, rsync is used, the diff file compressed. The diff is transmitted (whole or in part). Here it is appropriate to note that truncated diff-files' do not form any problem for rsync. There is however a drawback in that the running system might be in a half-half state, so we further assume that we only apply updates once they have been fully correctly transmitted. When the shore receives notification that a specific update has been successfully applied, then the update is applied against the Fake directory as well. Figure 5 illustrates this process. A realization of the above script can be done to have two directional updates, where both the ship and the shore can modify specific data on the running system. This process is depicted in figure 6. 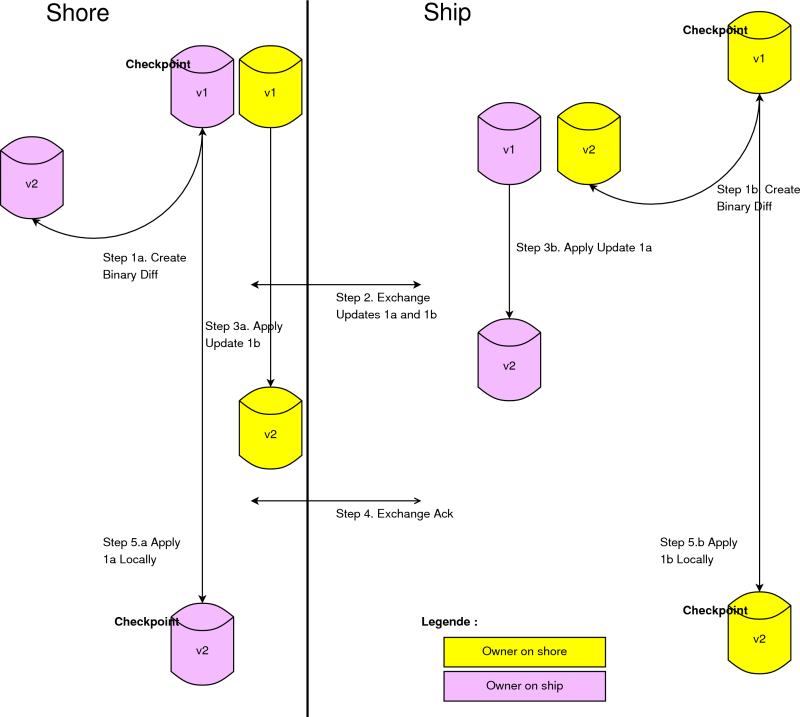 The idea in such a processes that specific parts of the file system can only be modified by either the shore, or by people on the ship (yellow versus purple). Aside from the capabilities to transmit only differences, a number of extra features of the standard rsync could be used in Dualog for other practices as well. The script assumes that all local disks are mounted under /machine/disk directories. The decrements will be stored in the director y 'decrements'. Each subdirecftory will have a timestamp datnig back to the moment the file was modified or pushed out. Since the suggested process involves an entire fake mirror of the state that should be on board of the ship, it is possible to verify which files have been altered without Dualog involvement. Essentially rsync does not provide such a feature since it involves checking the md4 checksum of all files. As I understand it now, this is not done and only for changes will such a thing be done. However, standard tools such as md5sum might still be a viable alternative. Rsync is unable to find shifts in files. When a data-stream receives inserts rsync will not be able to find any matching block. It seems that this was artificially introduced in the algorithm to avoid non matching blocks that would have the same checksum ? 22. The Windows 2000 Device Driver Book A. Baker, J. Lozano 2nd edition. Prentice Hall PTR, 2001.